I feel like talking about some pure math, just for fun on a Sunday afternooon. Back in 2006, Dan Christensen did something rather simple and got a surprisingly complex and interesting result. He took a whole bunch of polynomials with integer coefficients and drew their roots as points on the complex plane. The patterns were astounding! Then Sam Derbyshire joined in the game. After experimenting a bit, he decided that his favorite were polynomials whose coefficients were all 1 or -1. So, he computed all the roots of all the polynomials of this sort having degree 24. That’s 224 polynomials, and about 24 × 224 roots—or about 400 million roots! 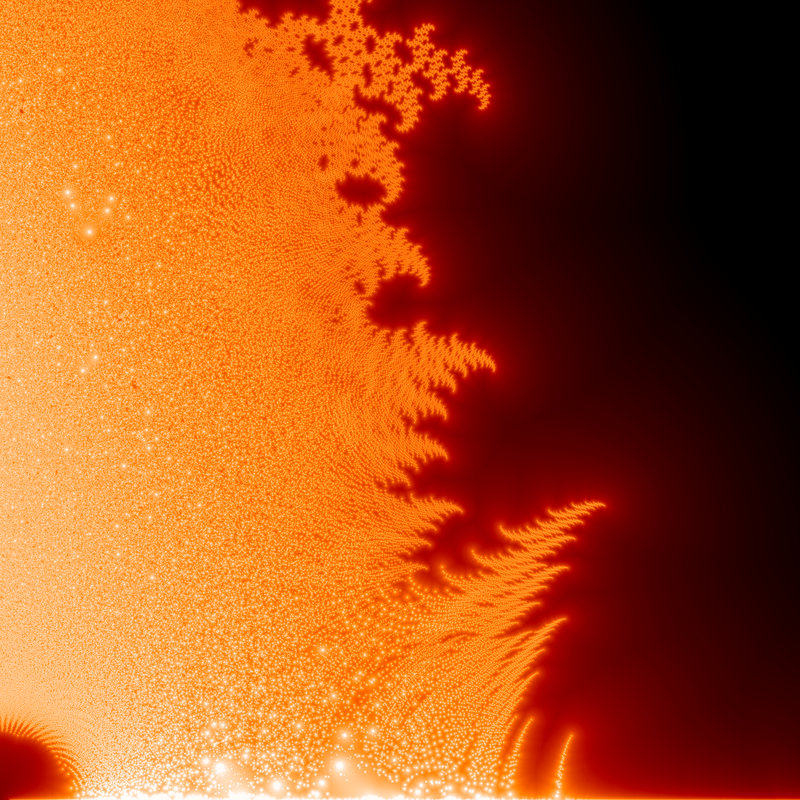 It took Mathematica four days to generate the coordinates of all these roots, producing about 5 gigabytes of data. Note the line along the real axis! It’s oddly hard to see on my computer screen right now, but it’s there and it’s important. It exists because lots more of these polynomials have real roots than nearly real roots. this point, but then suddenly drops off right next to it. Note also the subtle patterns in the density of roots. Now, you may remember that I said all this already in “week285” of This Week’s Finds. So why am I talking about it again? Well, the patterns I’ve just showed you are tantalizing, and at first quite mysterious… but ‘some guy on the street’ and Greg Egan figured out how to understand some of them during the discussion of “week285”. The resulting story is quite beautiful! But this discussion was a bit hard to follow, since it involved smart people figuring out things as they went along. So, I doubt many people understood it—at least compared to the number of people who could understand it. 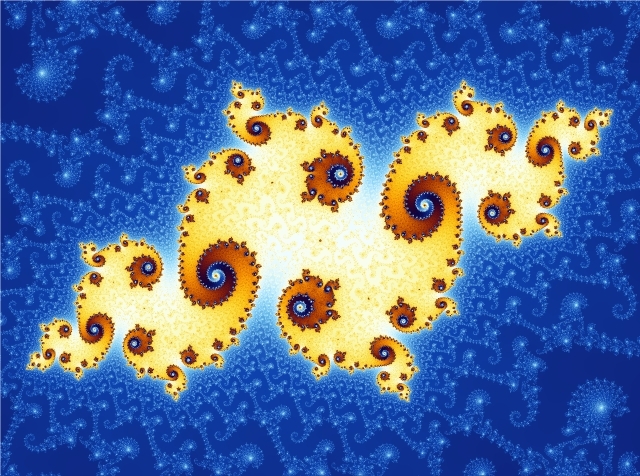 look so much like the fractal called a dragon? At each step, we have a continuous curve. The dragon that appears in the limit of infinitely many steps is also a continuous curve. 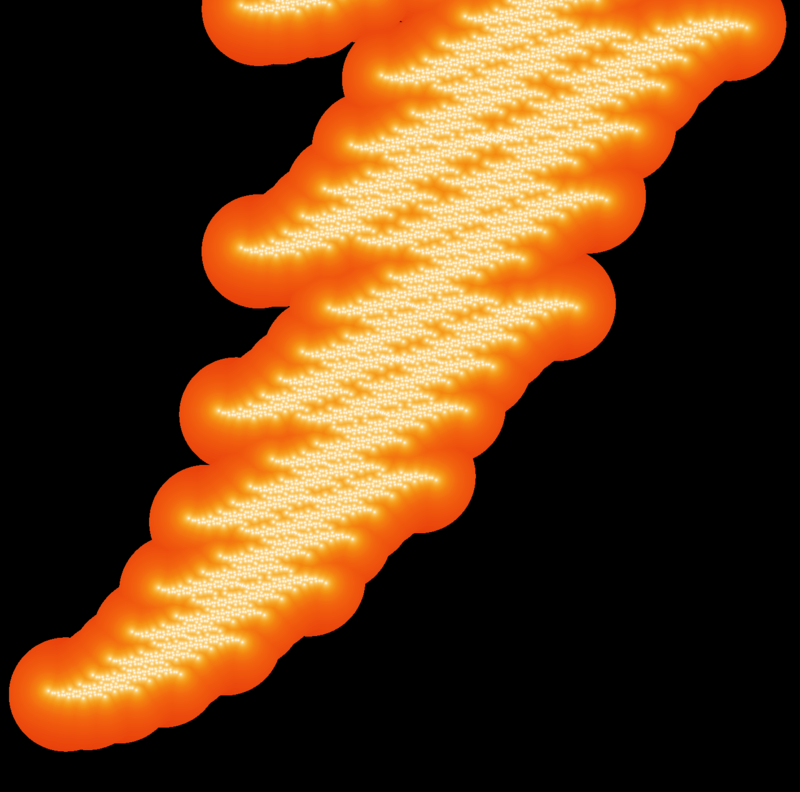 But it’s a space-filling curve: it has nonzero area! Pick a point in the plane and keep hitting it with either of these functions: you can randomly make up your mind which to use each time. No matter what choices you make, you’ll get a sequence of points that converges… and it converges to a point in the dragon! We can get all points in the dragon this way. But where did these two functions come from? What’s so special about them? As we repeatedly apply them, we get more and more segments, which form the ever more fancy curves in this sequence. All this follows from a famous theorem due to John Hutchinson. and so on. All these polynomials have constant term 1, never -1. But apart from that, we can get all polynomials with coefficients 1 or -1 using this trick. So, we get them all up to an overall sign—and that’s good enough for studying their roots. Now, depending on what is, the functions and will give us different generalized dragon sets. We need for these functions to be contraction mappings. Given that, we get a generalized dragon set in the way I explained. Let’s call it to indicate that it depends on . 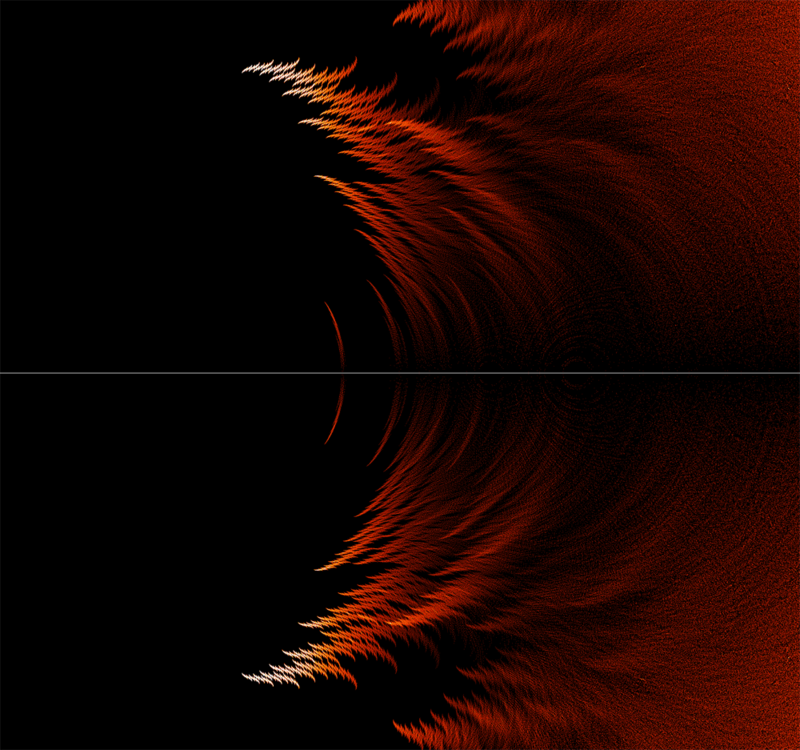 Near the point z in the complex plane, the set Sam Derbyshire drew looks a bit like the generalized dragon set Sz! In fact they should look very much like this, but I’m too lazy to find the point and zoom in very closely to that point in Sam’s picture, to check! Again, it would be more convincing if I could exactly locate the point and zoom in there. But I think I can persuade Dan Christensen to do that for me. If you take the set Sam Derbyshire drew and zoom in near the point z, why should it look like the generalized dragon set Sz? And the answer was discovered by ‘some guy on the street’—our pseudonymous, nearly anonymous friend. 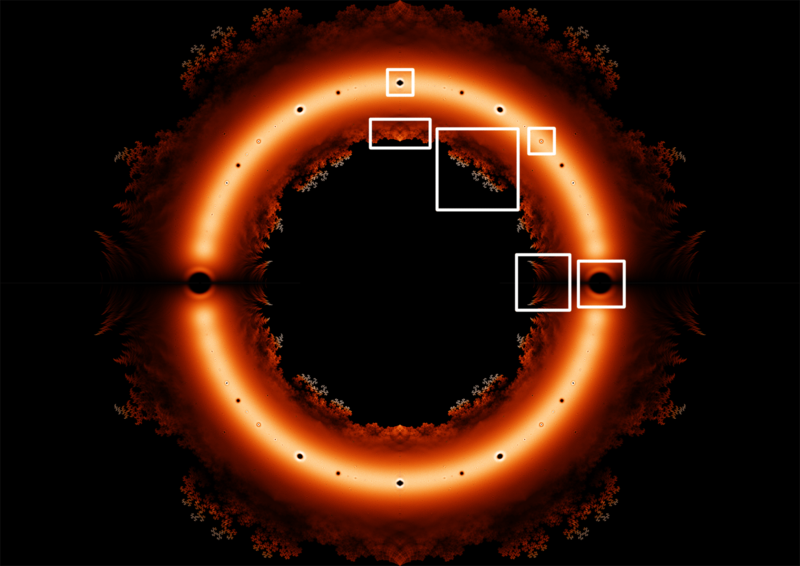 It’s related to something called the Julia–Mandelbrot correspondence. I wish I could explain it clearly, but I don’t understand it well enough to do a really convincing job. So, I’ll just muddle through by copying Greg Egan’s explanation. First, let’s define a Littlewood polynomial to be one whose coefficients are all 1 or -1. Moreover, we have seen that as we keep applying these functions over and over to , we get sequences that converge to points in the generalized dragon set . So, is the set of limits of sequences that we get by taking the number and applying Littlewood polynomials of larger and larger degree. It will look the same! But these inverse images are just the roots of the Littlewood polynomials. 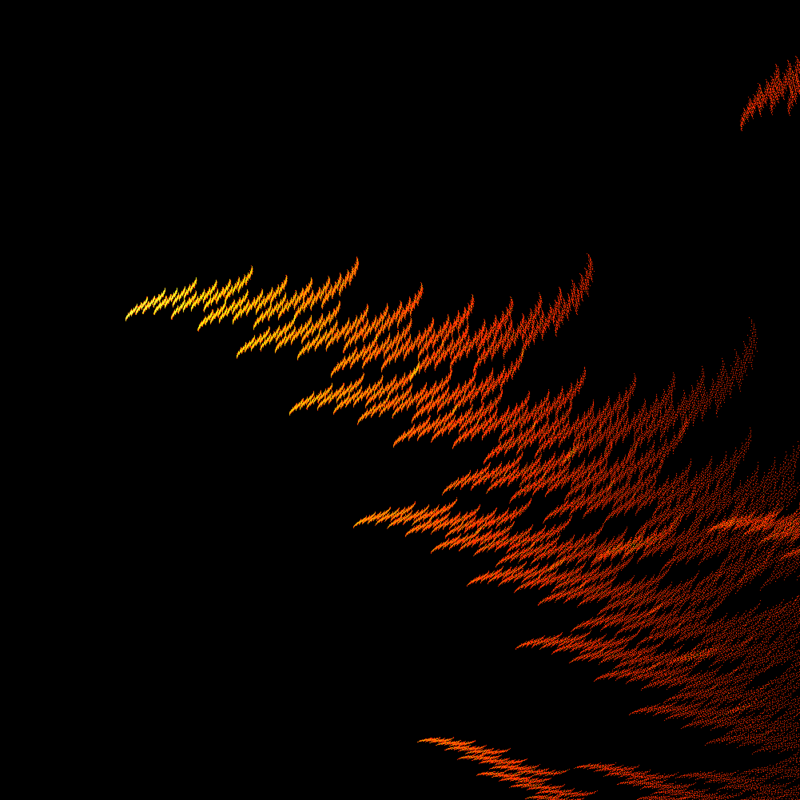 So the roots of the Littlewood polynomials near will look like the generalized dragon set . On the other hand, we can start with , and draw the set of numbers for which the resulting sequence doesn’t shoot off to infinity. 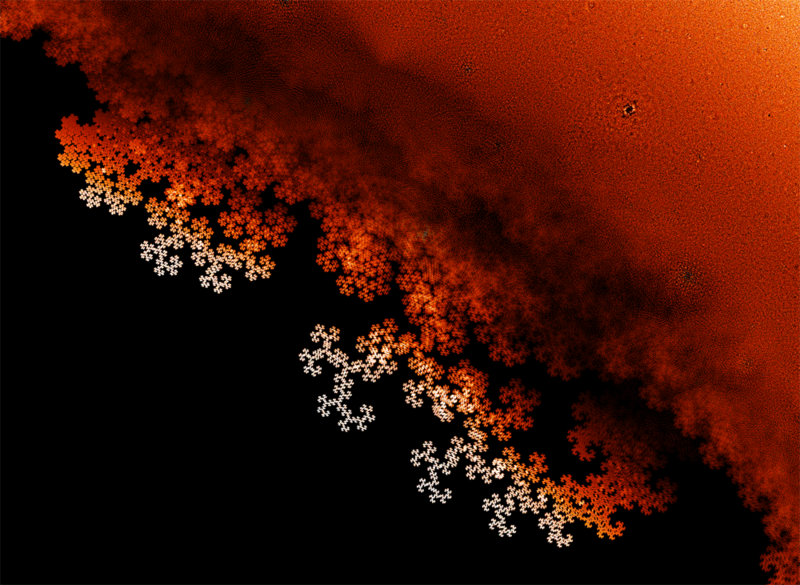 That’s called the Mandelbrot set. Here’s the cool relationship: in the vicinity of the number the Mandelbrot set tends to look like the Julia set for that number This is especially true right at the boundary of the Mandelbrot set. same value of They’re shockingly similar! lot of Julia sets! It’s like a big picture of someone’s face made of little pictures of different people’s faces. But this one you really must click on! 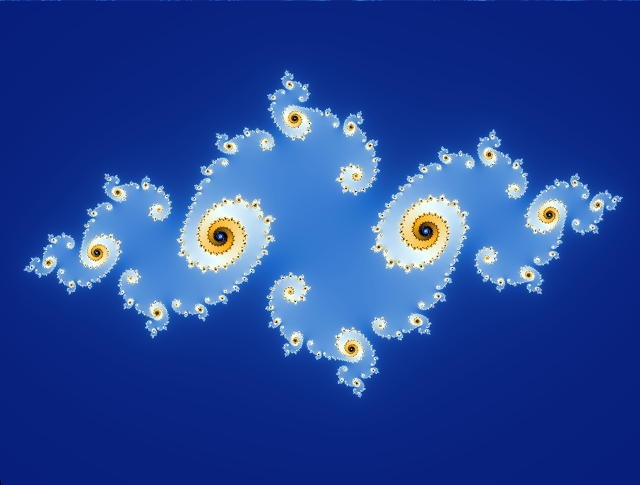 So, the Mandelbrot set is like an illustrated catalog of Julia sets. Similarly, it seems the set of roots of Littlewood polynomials (up to a given degree) resembles a catalog of generalized dragon sets. However, making this into a theorem would require me to make precise many things I’ve glossed over—mainly because I don’t understand them very well! For references to earlier work on this subject, try “week285”. This entry was posted on Sunday, December 11th, 2011 at 9:52 am and is filed under mathematics. You can follow any responses to this entry through the RSS 2.0 feed. You can leave a response, or trackback from your own site. given a collection of contraction mappings . 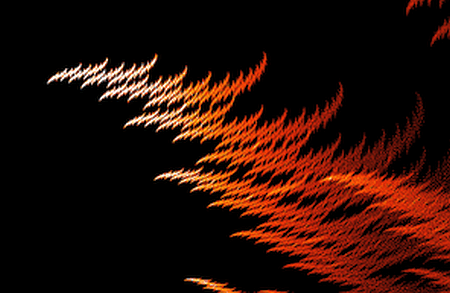 I’ve never used Apophysis or seen it used! Hi Sam, I’m trying to re-create the image but can not make it as beautiful as yours, I think the problem is with my coloring scheme. Could you explain me how did you color the roots? I coloured each pixel depending on how many roots landed in that 1pixel x 1pixel square. 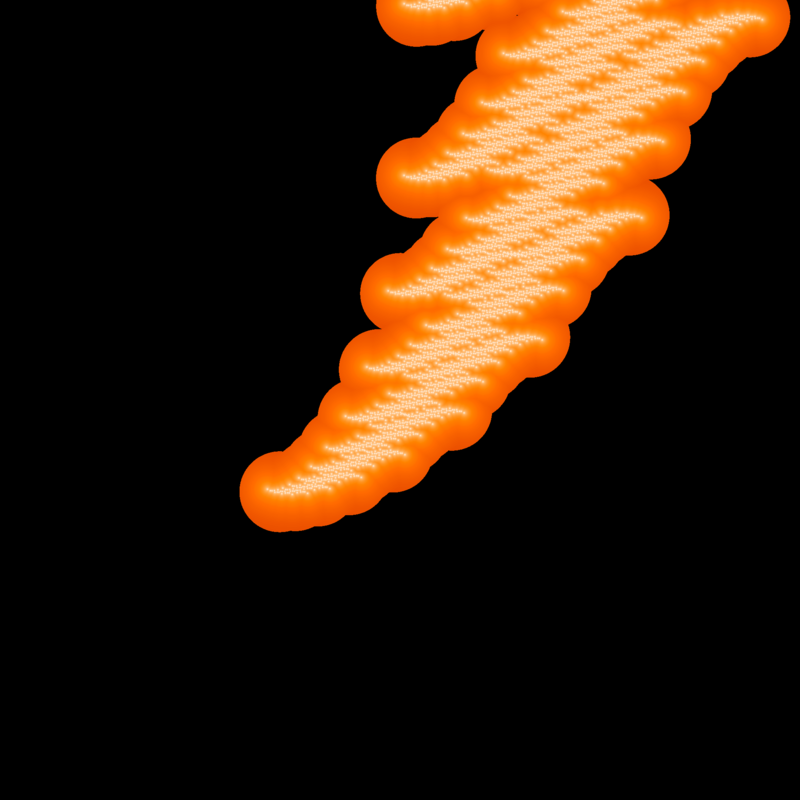 You can try various gradients, mine goes from white (for highest density) to yellow to orange to black (for 0 density). It’s important to have the resolution of the image match the number of roots: if you have too few roots for a given resolution, pixels would tend to not contain enough roots, and you can’t do much with that with the colouring. Excellent post, tyvm for breaking it down for us lay people. Most appreciated. You’re welcome. Mathematicians shouldn’t keep all the fun for themselves. Out of curiousity, was the first Julia set (and the second one, for that matter) produced using Mathematica? I think so, but I’m not sure: Greg can answer that! 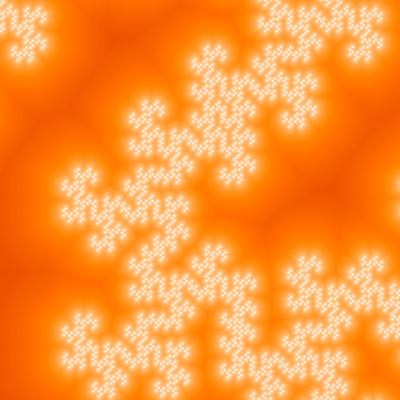 Yes, those Julia sets were produced with Mathematica. John – any idea/specifics on the Java programs used for this kind of thing? Thanks! I don’t know what software Sam Derbyshire used, but I think we’re planning to write a paper on this, so I’ll find out. It really wasn’t anything fancy, and probably very clumsy and thus took ages to compute. A Mathematica notebook computed the roots of all these polynomials, and output the data to several files (just storing the coordinates of the roots). Then a few Java scripts written by a friend (Chris Smith) converted this data to a PNG image (with customisable colours). Using python and scipy, and carefully taking into account the 8-fold symmetry, I can generate the degree 24 roots in about 3 hours, and plot them in about 10 minutes. I store about 55 million roots (again using symmetry). It shows subsets of the Derbyshire set of order 16: that is, the roots of polynomials of degree 16 whose coefficients are all 1 or -1. Each frame shows the roots of such polynomials with a particular number of coefficients equal to 1. The idea came from: https://johncarlosbaez.wordpress.com/2011/12/11/the-beauty-of-roots/ But instead of finding roots, this just evaluates the polynomials at and gives the pixel a lighter color if the values are close to 0. Yes, all the polynomials are evaluated. Then I take the sum of of the results. It is too slow for polynomials of degree 24, but works nicely for degrees around 12. And I multiply the result by to bring out the roots at the outside a bit more. I really enjoyed your blog post on this topic John, and was inspired by Sjoerd Visscher’s beautiful rendering to write some code of my own. The interesting thing about this alternative algorithm is that you can compute zooms of the pictures without calculating all the roots up front. Carlos Scheidegger: Very nice! Having an interactive tool makes it possible to pick out some subtle details which would otherwise be lost. 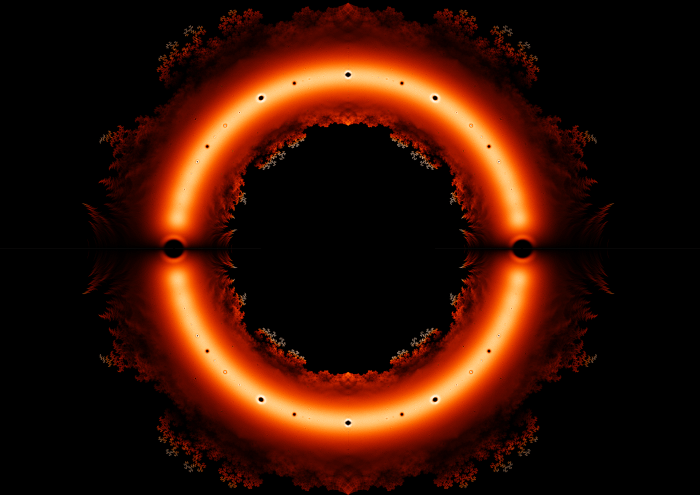 Chris Foster: I think those pictures are beautiful, but mathematically the problem is that just because a polynomial is close to zero doesn’t mean there is a root nearby. There could be one, none, or many nearby. We can do exact degree 26 zooms fairly efficiently, but I expect you’ll find it hard with your method to go farther than this. As a test, can you try a close-up somewhere of degree 28? Chris Foster: Thank you! I have the data for polynomials of degree < 20, but it’s 200MB and I didn’t want to make github sysadmins angry. If any of you folks want it, just let me know. 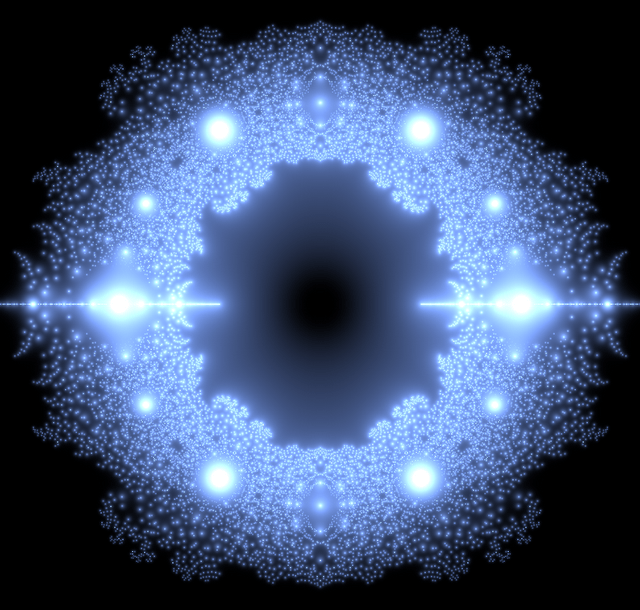 John Baez: can’t speak for exactly how that picture was generated, but in general, most such fractals are manifestations of the Cantor set, with the visual structure made clear by the de Rham curve (I realize as I write this, it should be called the “de Rham algorithm”.) As it happens, I’ve often drawn pictures that resemble the above, by accident, while trying to draw something else; unfortunately I’ve discarded these. However, here’s a collection/survey of simpler shapes: http://linas.org/math/de_Rham.pdf and perhaps the curves on pages19-21 come closest visually, but are still far off. One can come much much much closer. 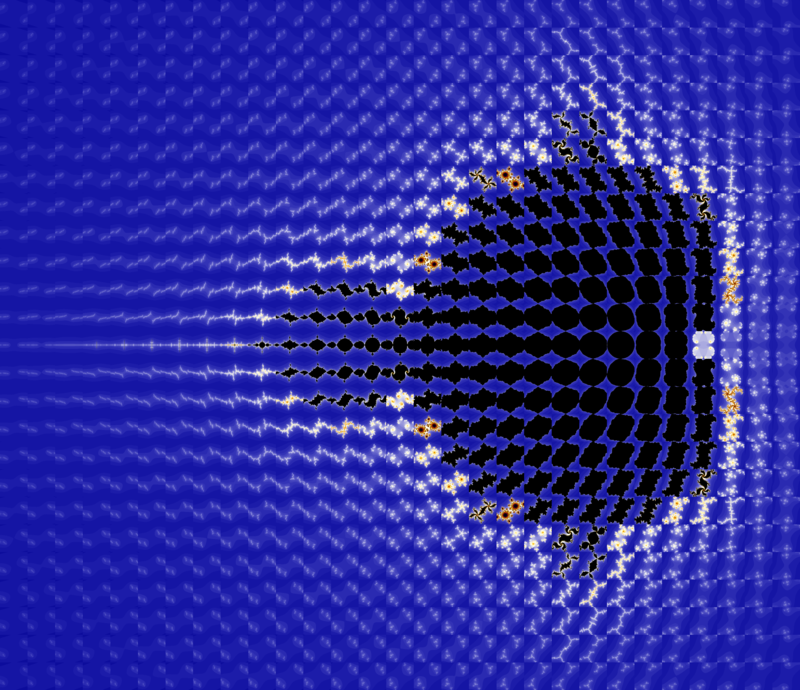 Also, the pdf surveys the iteration of just some 2D matrices; one can iterate on any pair of functions in this manner. Anyway… the curve pictured above also resembles a broken-up version of the Minkowski question mark function (… I really wish I’d saved some of the failed drawings…). The question mark is explicitly a de Rham curve, but also, as it happens, the question-mark is more closely related to modular forms than most typical fractals, and so to elliptic curves. Insofar as elliptic curves are connected to 24 dimensions via moonshine theory, perhaps there is some extra-doubly-interesting stuff going on in your picture, but naively speaking, I’ve seen those shapes many times, in much simpler settings, and so can’t imagine this connection to be important. But hey..
Well, OK, to clarify… the symmetry of the Cantor set (and of all de Rham curves) is a certain period doubling monoid. This monoid is embedded in the group sl(2,Z) that gives the symmetries of modular forms; in a certain sense, the monoid is exactly 1/3 of sl(2,Z) Now, the number 24 is a recurring theme in elliptic curves and modular forms, e.g the dedekind-eta/euler-phi, it shows up everywhere; one might say, for example, its due to the triangular shape of the fundamental domain in this problem. But fundamental domains don’t have to be triangular, so one of my unsolved homework problems has been to understand why analogs of the monster group don’t occur for other shapes/generators. Sigh, wandered off-topic again. I can provide more detailed references for any unclear/vague claims above on request; I’ve studied around this area a lot. 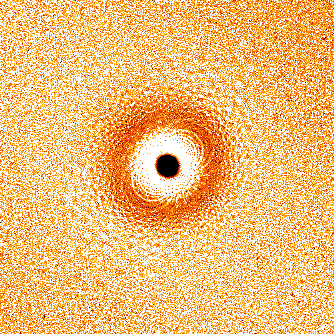 Dan Christensen: ok, generating that 400×400 pixel zoom at degree 28 took ~4 hours using my code – not exactly what you’d call interactive! Have a look at the album I linked above if you want to see the results (I’ve captioned it appropriately). I had to guess at the zoom resolution before starting, so the individual roots aren’t perfectly resolved. It involves an iterated function system based on two affine maps from the complex plane to itself. They use it to prove the closure of this set is connected. I got so excited about it yesterday that I woke up in the middle of the night and couldn’t fall back asleep. It would be great if modular forms or SL(2,Z) got into the game somehow… but I assure you that Dan plotted the roots of polynomials of degree 24 merely because degree 25 would take too long! Linas Vepstas: I read your paper on de Rham curves – great pictures! – and there seems to be some connection both to what we’re doing (pairs of affine contraction mappings from the plane to itself) and what Odlyzko and Poonen are doing (using the Cantor set to create a path from one point to another). But I don’t know if our pair of affine contraction mappings obey the condition you impose, namely that the first map applied to the fixed point of the second equals the second map applied to fixed point of the first. I guess I should check! No, they don’t obey that condition, except in one very degenerate case where both mappings are the identity. OK, misunderstood, I thought there was a claim that something happened for n=24 that didn’t happen elsewhere. As to modular forms: I re-iterate: the Cantor set has some of the same symmetries that modular forms do (well, exactly 1/3 or them, in a certain sense) So, as soon as you say “cantor set”, you de facto get sl(2,z) lurking in the general vicinity. Chris Foster: The degree 28 close-up is great! While it’s not rigorous, it sure seems very clear where the roots are. It took me about 6.5 hours to generate all roots of degree 26, and it would take about 8 minutes to generate an image of any region at any zoom level (although I haven’t done so yet because I need to reorganize the code a bit to not keep all roots in memory). Degree 24 roots take about 2 hours, and the plots take about 2 minutes each. Dang, I didn’t notice you posted a URL with the picture. Stupid me. I feel foolish now. Just looked at it. What you call the “dragon”, and the “feather” are exactly nothing less nor more than certain specific deRham curves, using more-or-less exactly the same construction. (Yes, this is the same deRham as that of cohomology, he described these curves when younger, and then changed to focus on algebraic topology). Dan Christensen: Thanks! With the timings you’ve posted above for degree 26, I suspect it’s very likely that finding the roots directly (ie, your original method) is a far better option, even for deep zooms and where you care more about the picture than precisely identifying all the roots. I don’t know what your code looks like, but I treated this little problem as an excuse to pull all the optimization tricks I could think of, just for kicks: (1) It makes use of the obvious symmetry to only touch half of the polynomials (2) Evaluating the set of all polynomials recursively results in only about ten float adds/muls per polynomial evaluation (3) It’s parallelized using openmp, which means 4 threads on my machine (4) it’s written in a fast language (c++) (5) It uses SSE intrinsics in float precision to do four operations at once (6) some microoptimizations like a little loop unrolling. (7) Yikes, I think I’m out of tricks, short of a GPU implementation! Chris Foster: wow, you worked hard. My root generating code is in python, single-threaded, but makes use of the eight-fold symmetry in the polynomials and uses scipy for the root finding. What’s the 8-fold symmetry? Multiply by -1 (no change to roots), replace x by -x (negates roots), and reverse the coefficients (inverts the roots). My plotting code is in python using numpy and PIL, with some hand-coded C, but the time is dominated by decompressing the file on disk containing the roots. If I keep the roots in memory, as I can up to degree 24 or maybe 25, I can generate plots in under a minute. Heh, I went overboard on the optimization but it was good fun. Nevertheless the C++ code is only ~100 lines long, not counting a generic SSE utility class. I can see how those extra symmetries help you, but I’m pretty sure only the first one applies to the method I’m using (unless you want to generate an image of the whole thing that is, in which case I just render a quadrant and mirror it). My prototype code was also in scipy by the way, and I use matplotlib for plotting all the results. He does not cite deRham. But if deRham did it first, I should cite him! Do you have a reference? I always like going back to the original sources of ideas. I thought I was being good by citing Hutchinson instead of Michael Barnsley, who popularized the idea of an iterated function system – most people associate the idea with him! John Baez: Perhaps de Rham’s work is Ref. of this paper: http://dx.doi.org/10.1007/BF01819277 ? Unfortunately the title of the deRham paper is not in English, but the paper I linked has a brief summary at the very top and it looks about right at a glance. Dan Christensen: I have pretty much the same data-generating code as you, but I threw in some “import multiprocessing” pixie dust, and voila, almost linear speedup. I’m just posting this here in case you’ve never heard of python’s multiprocessing. Oh ho! Guys! 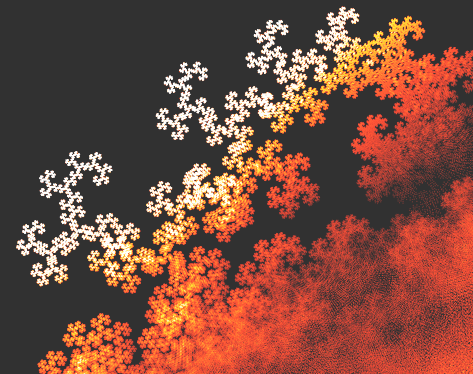 I just figured out how to improve my algorithm using bounding and tree pruning during the recursive polynomial evaluation, and I can now render this stuff /insanely/ fast. For instance, I’ve uploaded a 2000×2000 pixel render at degree 42 to my album, and this takes just seconds to render! The polynomials are evaluated using a recursive algorithm to compute all possibilities. Part way down the recursive tree you have a partially computed version of all polynomials toward the leaves. If you can prove that the absolute value of this partially computed version is too large for the remaining terms to reduce the polynomial to zero, you can prune away an entire section of the tree of all possibilities in one fell swoop. As it turns out, the plain old triangle inequality is sufficient to compute an extremely efficient bound, at least anywhere away from the unit circle. Edit – Another way of looking at it: Inside the unit circle, the terms z^n decay exponentially with n, so we can get a very good idea of the final value by evaluating only the first few terms. On the unit circle the method works far less well, because all the terms z^n have the same magnitude. Outside the unit circle, it’s easiest to just map back into the unit circle using z’ = 1/z, and the terms decay in the same way. Edit2 – There’s no reason that this same method shouldn’t work for computing exact roots at arbitrary zooms either. 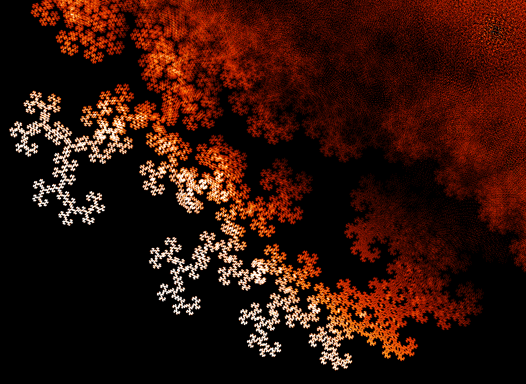 Vague strategy: Perform the recursive pruning method, but instead of computing the value of the polynomials at each pixel, output a list of the polynomials which may have a root nearby. That list should be rather short, and you may then compute the exact roots using a standard polynomial root finder. Caveat: as I’ve stated it, this still involves point sampling, so it may miss polynomials with roots between pixels. I have a suspicion that the answer is interval arithmetic, but I don’t know anything much about that. Chris Foster Wow! Very cool. As you point out, the mathematical difficulty is that roots may be missed, or that a root might be counted when it actually isn’t a root. But either using interval arithmetic, as you suggest, or bounds involving the derivative, it should be possible to deal with this. That’s excellent! I was thinking of something similar, but instead of thinking of polynomials I was iterating the maps z -> 1+zc and z -> 1-zc, and throwing away things that become too large as they won’t contribute to a 0 nearby. It’s great that you are managing to make detailed pictures of small areas! proves that every z with 2^(-1/4) ≤ |z | ≤ 1 is a limit of roots of polynomials with coefficients 1 and -1. In other words, roots are dense in this annulus. So, if we’re only interested in visible features that remain when we draw the roots of all polynomials of this type, we might as well assume |z| < 2^(-1/4). I haven't read this paper yet (and it may take a little while, since it's in French, which I read slowly). Thanks for the link to that paper by de Rham, by the way! I need to look at that too. Above you’ll read how Chris Foster found a blazingly fast way to explore the beauty of roots. He has kindly allowed me to show you some of his results here. 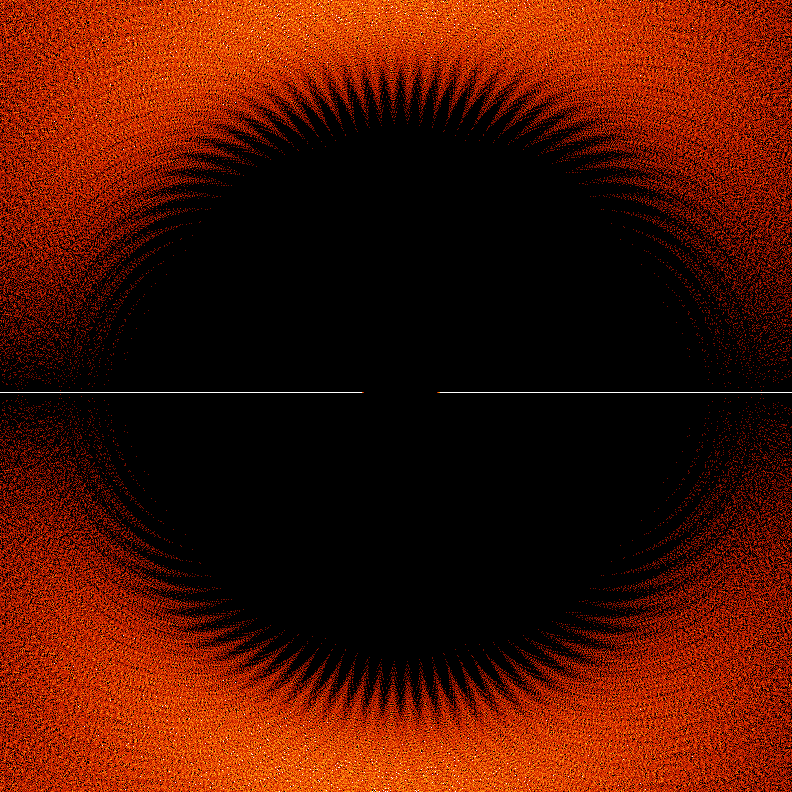 Here is Chris Foster’s picture of the roots of degree-20 polynomials with coefficients ±1 in the rectangle [1,1.7]x[0,0.7] in the complex plane. Click to see the full 4000×4000 pixel version! I think the pattern of white dots here is very charming! The white dots are the actual roots. I think the orange background around them is just an artifact of the imaging technique. So this is really the familiar “feather” pattern again. I wrote a Java applet that lets you view the Littlewood roots interactively. 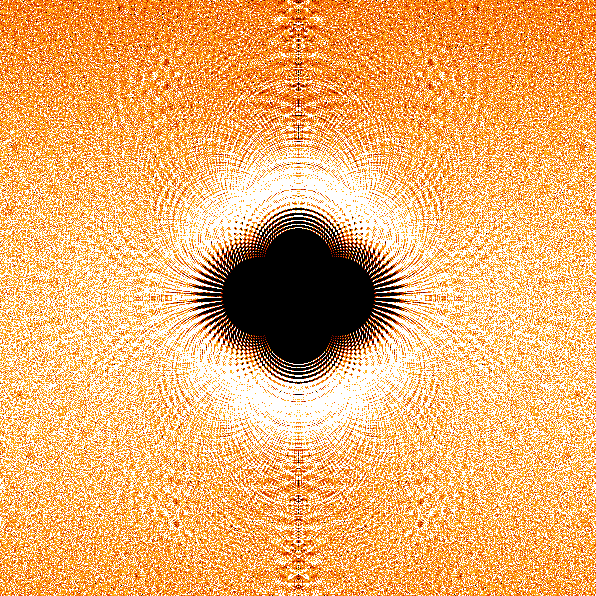 This limits the view to a radius of 0.8, and shows a default order of 20, but it can display up to order 36 if you select a smaller view that excludes the dense part of the ring of roots. The method I’m using is not quite pixel-perfect: a single root will occasionally be displayed in two adjacent pixels rather than just one. I added a facility to the applet that lets you see the “Julia set” for any point. Here’s a movie of the changing “dragons” as you move around the root set. Ooh… Shiny. This is why I love math. And maybe you are interested in the graph of the polynomials in R2 to understand better what is happening in the closure. I am being paid to make a web site for someone, and would like to use this as the background. Could you link to this Sam Derbyshire? If the email address you used in your comment is valid, I can send Sam your comment and your email address. Or, perhaps this email address will work for him. I’ve emailed him, thank you for the link! Bohemian eigenvalues are the distribution of the eigenvalues of a random matrix. More specifically, this article explores matrices of low dimension (typically no larger than 10 × 10) whose entries are integers of bounded height. The name “Bohemian” is intended as a mnemonic and is derived from “Bounded Height Integer Matrix Eigenvalues” (BHIME). Here I present an overview of some preliminary results arising from this project. I know I’m commenting very late, but I love this post and am sad to say all the images hosted on math.ucr.edu have vanished (along with the mirror that was there too). The server hosting math.ucr.edu went down about 3 weeks ago due to a power outage, along with all other computers at U. C. Riverside. Unfortunately this particular server was unable to reboot so they had to replace it. The machine has been replaced, but only yesterday was I able to log in and tell them where in the directory hierarchy my website was located, so they could make it visible to the world. They are trying to do that now. So, in a few hours, or days, or weeks, my website and all the images it hosts should reappear. math.ucr.edu is back up! If anyone experiences any problems with it—e.g., missing files—please let me know.